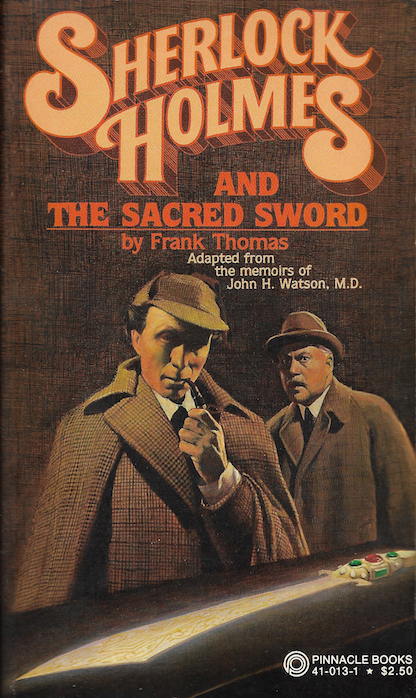 Frank Thomas' follow-up to his first Holmes pastiche Sherlock Holmes and the Golden Bird. The image of Holmes on the cover is Alfred Burke from a revival of the Gillette play in 1952. Watson, of course, is Nigel Bruce. The book was reissued with new cover art in 1985. A dying man arrives at 221B Baker Street. . . .
An eccentric burglar scandalizes Sussex. . . .
then disappears. . . . This bizarre sequence of events propels Sherlock Holmes and Watson on a strange odyssey, from Baker Street to the back canals of Venice, from Berlin to exotic Egypt and the Valley of the Kings––in search of the sacred sword and a false prophet who threatens to trigger a Holy War in the Middle East––unless Sherlock Holmes stops him in time. In the great tradition of Sir Arthur Conan Doyle, another rare tale of intrigue, deductive reasoning, and confounding mystery to delight and tantalize Sherlock Holmes fans around the world.